In its infinite wisdom, the Big 12 today announced its all-conference team for 2010, a mere five days before its most important game of the season. Even better, awards were based on balloting held before last weekend's games. 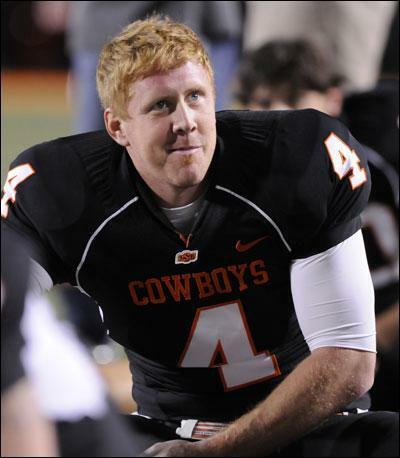 That may help explain such mysteries as the inclusion of 56-year-old Brandon Weeden of Oklahoma State as the first-team quarterback, despite a mediocre performance last weekend in the Cowboys' 47-41 loss to the Oklahoma Sooners. Tony Jefferson was the only Sooner to win any of the individual awards, sharing defensive newcomer of the year with Shaun Lewis of Oklahoma State. Overall, OSU put nine players on the first team to OU's five. That makes complete sense. Also, the honorable mention list apparently includes anyone who set foot on the field in shoulder pads this year. Anyway, look for the Third Annual Homie Awards next week once all the data have been collected.